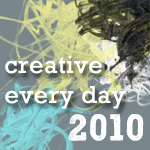 Ways to share: Once you've signed up, you can leave a comment on this post and/or use the "Mr. Linky" widget below to link to a blog post(s) about your creative activities during the days of 8/23/10 - 8/29/10. i have so much creative fun planned for this week. i am getting caught up on a lot of unfinished projects so make space to start fresh new projects in the fall. i am finishing up kits and prepping for workshops and painting and sewing and playing. i love this week already! sending happy smiles to all of the creatives. The summer heat is zapping my creativity today, but I’ll drag myself to that easel yet! OH for another, Creative Week! I’m “fire-less” out here in on the Washington coast…burn ban and fog! It’s been fun playing with lighters! i had a lovely “art date” with a girlfriend visiting from out of town … we talked about supplies (”goodies”) and then worked in our journals, drank tea and fed each other’s creative fires. i definitely want to plan future dates with others creatives! i also finished up several pages/spreads started while on vacation AND i began an online sewing course (i know, i am crazy!) and finished 2 projects. i am excited for the next sewing project because it is a tool caddy for my brushes – how cool is that?! guess i am living the august theme – on fire! and this week begins another painting adventure with the ever-fabulous Connie of Dirty Foot Prints Studio. YUM! I haven’t produced much in the way of “fine arts” this week, but I am certainly living a creative life & I posted proof. And I’m thankful I didn’t start a grease fire with my latest play in the kitchen, HA! Surviving and hope to do some creating this week. Dr.’s 5-15% chance of survival prediction. The inspiring video is ready to see and I am hosting a Miracle Party this week that you all are invited to participate in! Stop by and read/see all about it and the makeover. Art does heal!! Love you! Have a beautiful week. Thank-you Leah for hosting this event. My challenge everyday lately has been to keep the fire of inspiration burning. blech. I’ve been in the “creative zone” this past week…so much so, that I’m behind in taking pictures and posting my work. Good problem to have. Leah and other Creative Everyday friends, I’m still a little overwhelmed but thought I would let you know that Sam Juliano from the blog “Wonders In the Dark” posted an interview with me today “Artist and nature lover Terrill Welch Mayne Island’s Resident Creative Potager” http://wondersinthedark.wordpress.com/2010/08/23/artist-and-nature-lover-terrill-welch-mayne-islands-resident-creativepotager . Please, come on by and sit by the fire and enjoy the connections. What it reminds me of is a passion which explodes when webs of connections with other creative people deepen in our wonder about the ordinary. The ordinary of our lives that somehow seem extraordinary when told by another. Wow! Great to see everyone getting “fired” up for another week. I have been away sooooo much over the past few weeks and have had no time to create art in the formal sense. But I’ve been generating ideas and collecting bits and pieces on my travels. Got a huge new easel yesterday to support my goal of creating some large pieces. Woohoo! Exciting. August is in it’s last week and I feel reflective, a bit tired. I’m looking back at this years CED challenge posts and notice a rather obvious drop in the number of posts. Why? Hm it’s not for lack of creativity, I’ve been creative and doing a lot of things everyday. But i don’t write about the process. And I know that is about to change, maybe it’s a shift, like the change in weather and the early signs of the change in the seasons that will trigger me posting more CED accomplishments. But I hesitate to post my link here on weeks where I simply know in advance I won’t be updating my blog much. Yet I want to just make a point, the CED is wonderful and a very welcomed part in my life every day, for it keeps my focus and makes me appreciate my “productivity” even if I don’t post about it on my blog and share it with the world. After creating the start of our veggie garden early this winter, I am finally seeing the ‘fruits’ of our labors! Loved your yarn piece for the fire theme Leah. But yeah, I know what you mean about touching the gooey yarn. Bummer time. This will be a new journey. Being inspired by joining in the: Miracle Party. Sharing “just feelings” in a positive way through my digital art. I am greatful. I am ready to become aware of “Creative Awakenings. I have done a couple pieces in orange and red lately, I guess that can relate to fire theme this month. After my surgery this is really the first art I have done. Feels great to be back at it. I love you “fire Beneath” painting. I can so totally relate. I’m struggling to find my voice in art. It certainly is a struggle even though the creating is still wonderful. I’m back from a healing week at the Omega Institute and posted a drawing I did there on my blog. A belated check in and a blog post (Fire in the sky) about trying to keep up a creative practice during the school summer hols…. Hope you’re all having a wonderful creative weekend!